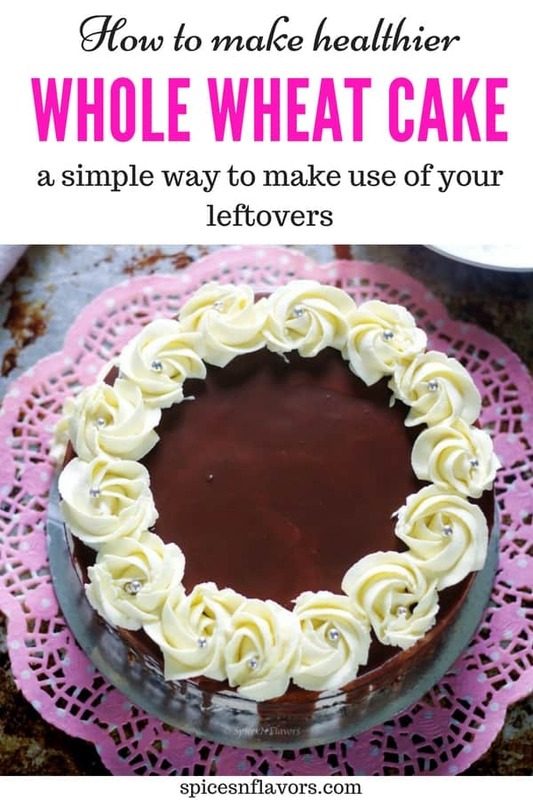 Atta Cake aka whole wheat chocolate cake made using leftover chapatis or leftover roti – Are you kidding me?? Well, if you are looking for some healthy dessert recipes then this Whole Wheat and Jaggery Cake is all you need. 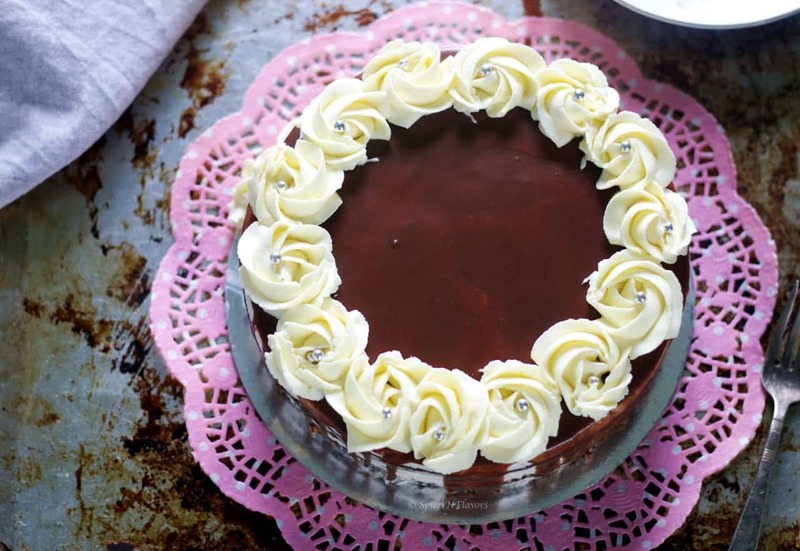 Slash some whipped cream and ganache on top and guess what you have a perfect healthy birthday cake recipe for you!! 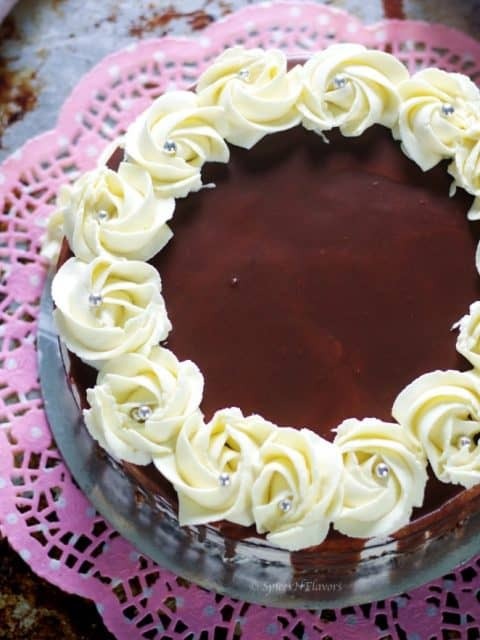 Atta Cake is one of those easy healthy cake recipe idea that you can adapt to either making a tea time cake or turn it into a full-fledged birthday cake or just serve it as healthy desserts with some cream on side. B. No refined sugar. To sweeten this cake we are gonna use jaggery. Well I won’t get into the details of why jaggery is a healthy alternative instead you can check it from here. C. In place of butter we are using oil here and that too olive oil. And apart from all this mentioned above, this is the best leftover chapati recipe or to say leftover roti recipe that one could ever think of making. I am awestruck by the deliciousness of this recipe. 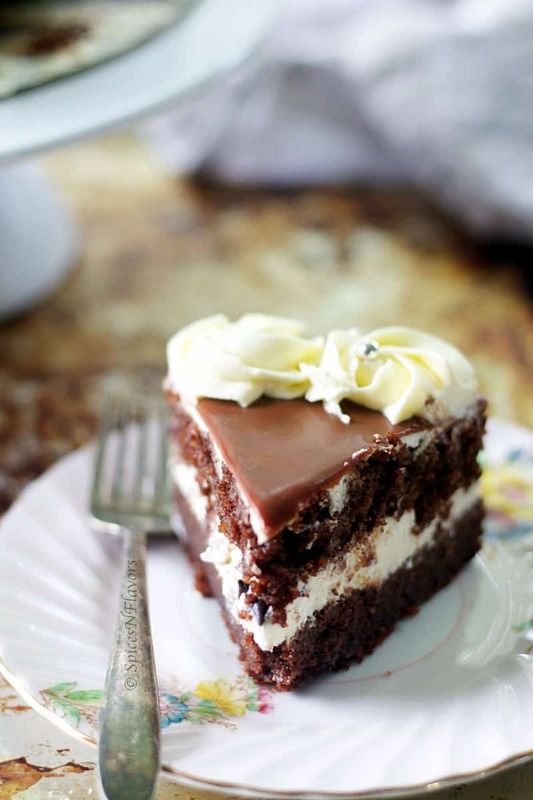 I am not surprised to say, this is the best chocolate cake recipe ever. The other day my husband went with his colleagues for lunch which means his dabba got back home. Well, that gave me the best opportunity to try this Eggless Atta Cake. It is not that I came up with this ingenious idea of using a chapati in a cake. I first saw this whole wheat cake here on Youtube. And then I adapted this idea to come with a healthy whole wheat cake recipe for you guys. Healthy Cake or healthy dessert recipes are quite a rage these days. With the changing mindset and the idea of sticking to a healthy lifestyle, people are growing a little more conscious about the calories that they are consuming each day. 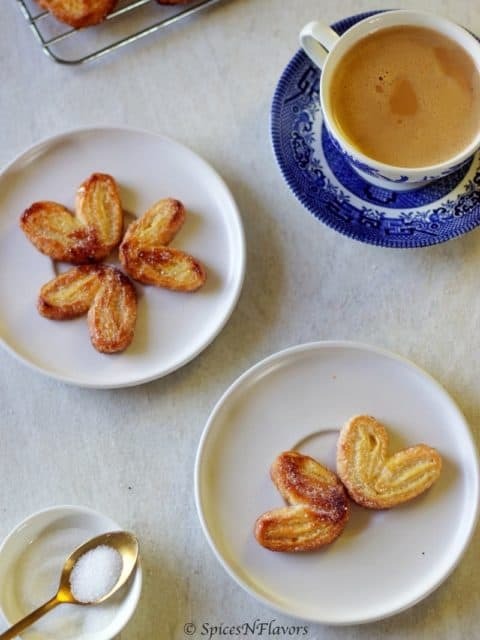 If you ask me I am not someone who follows it; you know it from this little space where each week I post, baking and dessert recipes which means I absolutely taste whatever I share with you. I would have been happy if it were just limited to tasting which is not the case. Usually, end up having half the cake myself..
We all have our very own favourite chocolate cake recipe right!! 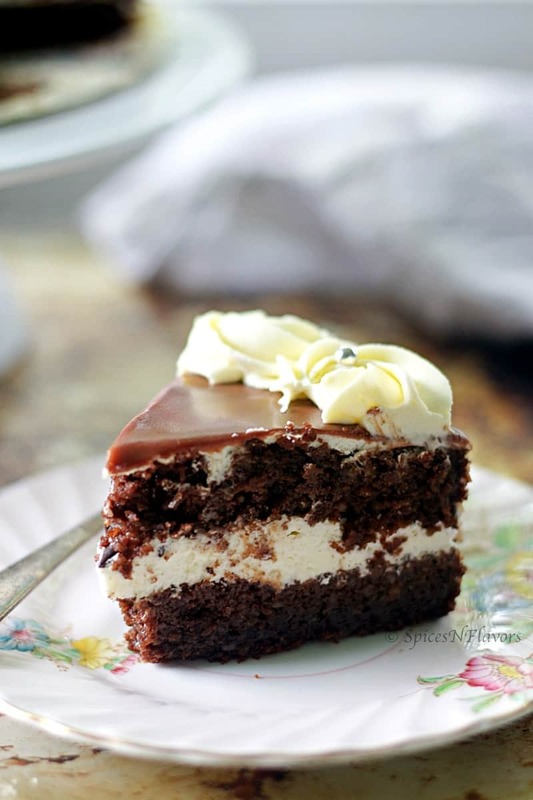 Well, this is just healthy chocolate cake recipe for you guys or should I say healthier for that matter. It is definitely chocolaty in taste and you won’t miss the sweetness too. Yes, it tastes different than a regular chocolate cake as the jaggery adds its own taste to this cake. Texture wise it has soft crumbs but is definitely on the denser side. But its one moist cake you guys, all thanks to the oil. And since I had added cardamom and saffron for flavouring this cake was a real festive treat. However, if you consider the cake in itself it is not at all sweet so if you wish to make it into a tea time loaf cake recipe or a breakfast cake then there are few alterations that you must consider about which I have talked in the notes section below the recipe card. Can I make eggless Atta Cake in Cooker? Yes, definitely you can make this cake in cooker. I have already shared how to make rava cake in cooker. You can follow the exact steps for this cake. Just that this cake would take anywhere between 35-45 mins to bake. How to make this Leftover Chapati cake in kadai? Well, all the steps remains the same. Like adding salt, stand, pre-heating and then placing the cake pan. This is a forgiving recipe you can absolutely bake it in any medium. Can I make this Atta Cake with egg? Yes, in place of yogurt you can definitely use 2 eggs. 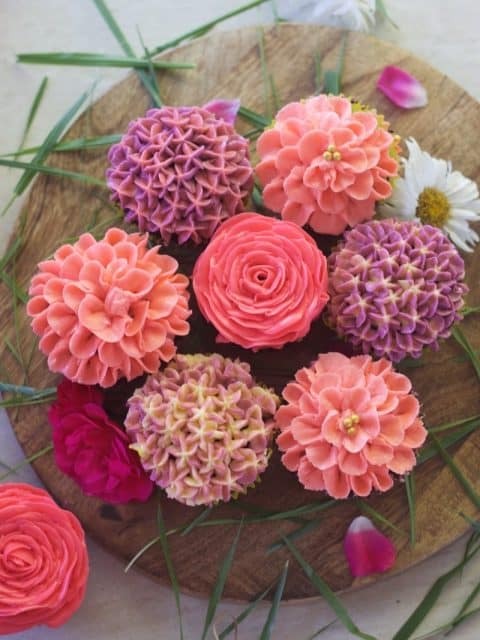 A perfectly delicious healthy baking recipes idea coming up your way!! Yes this easy Eggless Atta Cake aka Whole Wheat Chocolate Cake made using a secret ingredient is perfect as a breakfast loaf or slash some whipped cream and choco chips and turn it into a healthy birthday cake recipe. This cake made using leftover chapati, yogurt, oil without butter is perfect for your girls parties or Christmas or simple healthy desserts ideas. Sieve the rest of the dry ingredients together and add it to the chapati flour. Mix and keep it aside while we start working with the wet ingredients. Next, whisking continuously add your oil little by little to the curd mixture. This way the oil would completely emulsify with the curd mixture. Now our wet and dry ingredients are ready. Time to combine them together. So add one portion of dry ingredients to wet. Mix. Add 1/2 of the measured out milk. Mix. Likewise alternate between dry ingredients and milk starting and ending with dry ingredients until you reach the cake batter like consisteny. Do not over mix. Transfer the batter to the prepared cake pan and bake in a preheated oven of 180°C for 30-40 mins. It took me 36 mins to bake this cake. Take the whipping cream and the kesar essence in a bowl. Whipping continuously add the icing sugar little by little until you reach stiff peak stage. Heat the cream until it starts simmering. Add the hot cream on top of the chocolate chips. Cover with a lid and let it stand for 2 mins. After 2 mins stir the mixture to dissolve the chocolate completely. Add some whipped cream and spread it out evenly. Some choco chips for texture. And place the cake layer on top. Crumb coat with the remaining cream. Let it chill in the refrigerator for 15 mins. Then add the ganache on top and allow some of it to drip creating the drip effect. 1. The cake on its own is not sweet at all. 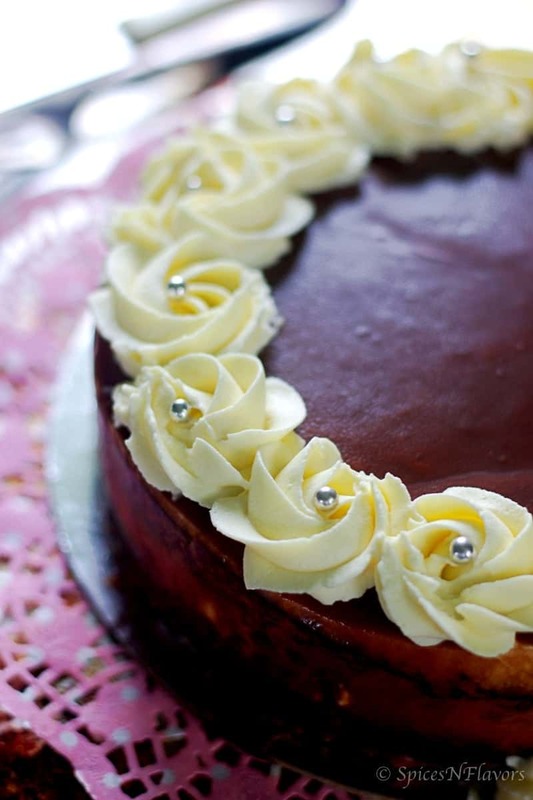 Only the addition of cream and ganache makes the cake a perfect healthy birthday cake recipe. 2. I choose to go for the naked cake look but you can frost the cake completely as per your needs. 3. Since this is really a soft and moist cake I would not recommend this for a tier cake. The maximum you can go for is 2 or 3 layers. Can I bake it into a tea time loaf cake or how to change it to a breakfast cake recipe? Like I mentioned since this cake is not at all sweet. I would recommend adding 1 cup of Grated Jaggery in place of 3/4 cup mentioned in the recipe. Secondly reduce the amount of oil to 1/3 cup instead of 1/2 cup. Finally add some chopped nuts like almonds, pistachios, walnuts, raisins etc as per your choice to make it wholesome. Why do we have to alternate between the dry ingredients and milk while making this Eggless Atta Cake? 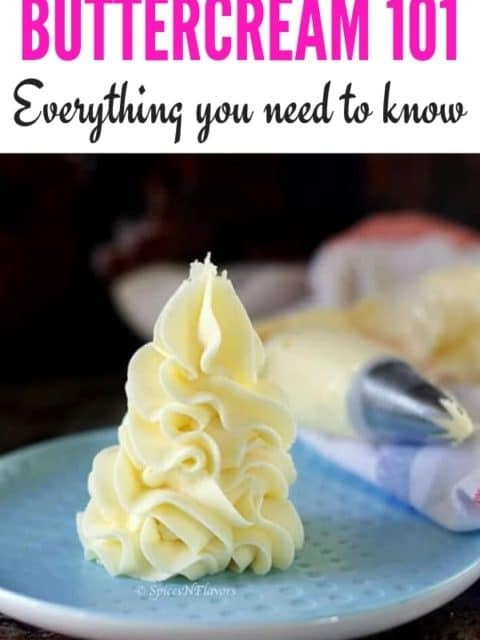 The main reason why do we do this in making any regular cake be it a easy sponge cake recipe or any regular vanilla or chocolate cake is to avoid over-mixing of the batter. 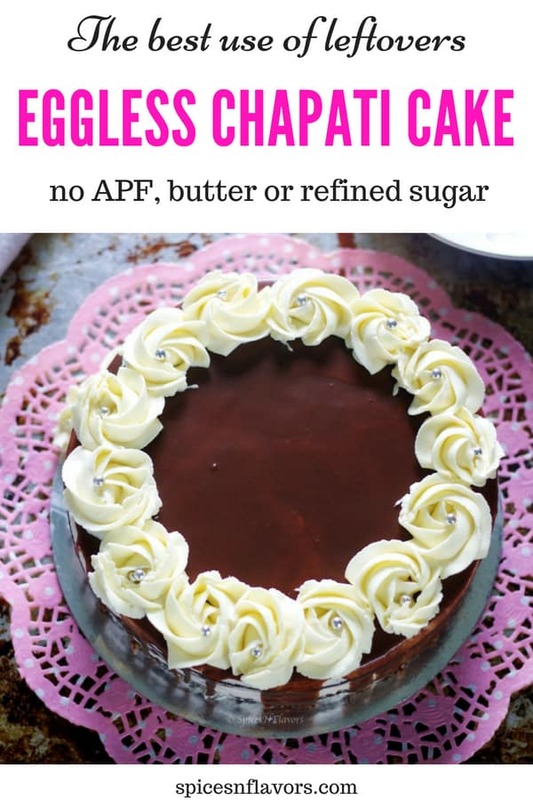 How long can I store Eggless Atta Cake? Why didn’t you add sugar syrup to your layers? This cake already is so moist that you do not need sugar syrup moreover since its a soft cake and if you are planning to layer it up; I am guessing that it won’t be able to hold the additional weight of syrup. Oh since you liked this cake I am pretty sure you would love this Eggless Whole Wheat Dates Cake that is also on the healthier side with no maida and no refined sugar. And if you liked my today’s recipe post then definitely let me know by tagging me, tweeting me or instagram me. I would love to hear from you. Hi I will surely try this cake. Before ur recipe I searched 20 recipes but I m happy that I tried this cake today I must tell you it’s tasty and yummy 😋 my kids love it n I m happy it’s healthy too. That sounds amazing.. I am so glad to learn that this recipe worked out fine for you and you and your family enjoyed it..
Hi loved the cake just a question when i make icing my icing tries to split and there are holes that develop onto it and it got little watery too btw i used heavy cream. Is there anyway i can keep my cream stiff / which gets hold for longer time? Thank you!! So glad to learn that you liked the recipe. Thank you for sharing your views. Coming to your query I think tropolite and Rich are the two top-selling brands for cream in India. Try to use those cream. Can i use jaggery that is already melted and stored in the refrigerator?